Jesus is NOT a conductor punching tickets for a train ride to heaven. Christian hope is not so much about getting from earth to heaven, as it is about getting heaven to earth. Jesus is NOT a lawyer to get us out of a legal jam with his angry dad. God is not mad at sinners. Jesus told Mary to tell his disciples that his Father was their Father too! Jesus is NOT a banker making loans of his surplus righteousness. Modern people love economic metaphors…but they are terrible! Economic metaphors invariably produce bad theology. Jesus IS a gardener! A gardener cultivating resurrection life in all who will come to him. The conductor, lawyer, banker metaphors are mostly false, giving a distorted view of salvation. The gardener (and physician) metaphor is beautiful and faithfully depicts the process of salvation in our lives. A gardener’s work is earthy and intimate. Gardeners have their hands in the humus. (We are humans from the humus.) Conductors and lawyers and bankers are concerned with abstract and impersonal things like tickets, laws, and money. But gardeners handle living things with living hands. Jesus is not afraid to get his hands dirty in the humus of humanity. That Jesus is a gardener with a good heart and a green thumb should change your perspective on life. I promise you that your life is not so messed up that Jesus can’t nurture you into a flourishing state. This is the good news! Take a leap of faith and believe it! Trust the gardener (and stay in his garden!) and Jesus will grow new life out of the husk of your old life. Please, stay in the garden. Yes, I know it’s easy to get depressed about ecclesial garbage. But just remember, even beautiful gardens have a compost pile. I know in my own life any fruitful result from my work of writing has only been possible because of pruning. If I had remained a church-growth, success-in-life unpruned pastor I could never have written on forgiveness and beauty, peace and love as I have. I had to be pruned. It was painful. Very painful. But I thank the gardener for it. So take heart, if you’re in the garden, the gardener is there. You may not always recognize him at first, but he is there. He calls you by name and his desire is for you to flourish. 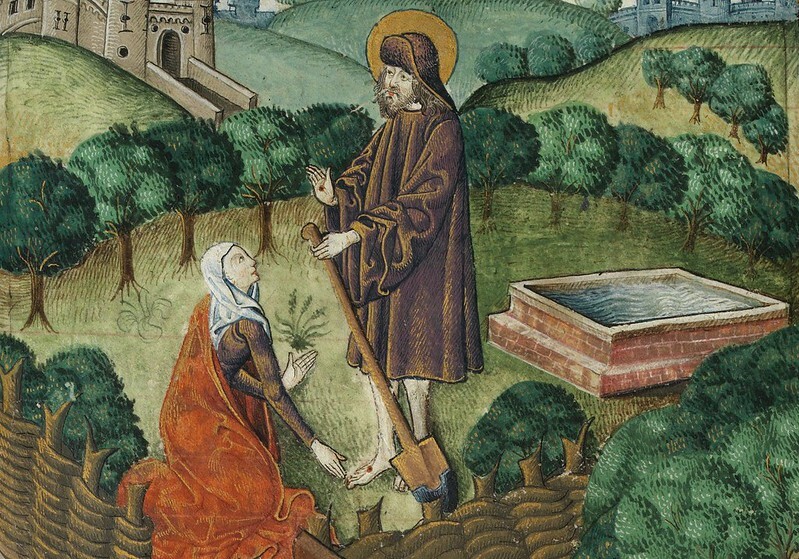 Believe in the gardener…for he is risen!